What is Drive Electric Week? Northern Colorado has joined the National Drive Electric Week initiative to continue spreading the word about our goals to facilitate widespread electrification of the transportation system! National Drive Electric Week, September 12-20, 2015, is a nationwide celebration to heighten awareness of today’s widespread availability of plug-in vehicles (PEVs) and highlight the benefits of all-electric and plug-in hybrid-electric cars, trucks, motorcycles, and more. Through a collaborative effort between Drive Electric Northern Colorado and its partners, Northern Colorado will host an exciting week full of numerous activities to educate businesses, organizations, and individuals about Electric Vehicles (EVs). DRIVE. Sept. 12 & 13: DENC will be hosting an opportunity for Northern Coloradoans to get behind the wheel of seven different EVs including vehicles like the Tesla Model S, BMW i3, Nissan LEAF, Mitsubishi iMiEV, Ford C-Max Energi, Ford Fusion Energi, and Chevy Volt*. This Ride and Drive event will take place on Saturday September 12th and Sunday September 13th at the 16th Annual Sustainable Living Fair. Click here for more details. At this event, the DENC team and EV owners from Fort Collins and Loveland will answer your questions about EVs, charging, and other EV-related questions while you test drive multiple different EV models! There will be a second Ride and Drive event on September 12th, so please stay tuned to the DENC events page for more updates. CHARGE. Sept. 15: On Tuesday September 15th learn how your workplace can join companies like Hewlett Packard, Odell and New Belgium Brewing Company, and the City of Fort Collins in becoming leaders in innovation by reducing harmful tailpipe emissions through workplace charging. Any member of your company or organization can attend the workplace charging workshop during Drive Electric Week to learn from other companies and organizations who are currently offering workplace charging. See below for more details and how to register for this unique workshop. SHARE: Raise awareness about Drive Electric Week through your social network by tagging DENC @DriveElectricNoCo (Twitter) or @Drive Electric Northern Colorado (Facebook). We have crafted some ready-to-use social media posts below to make this as easy as possible for you. *We cannot guarantee that each vehicle will be at every event. What: Learn about the ins-and-outs of providing EV charging at your workplace including infrastucture options, installation recommentations, policy recommendations, and other great information that will help Northern Colorado businesses learn about joining the Workplace Charging Challenge. 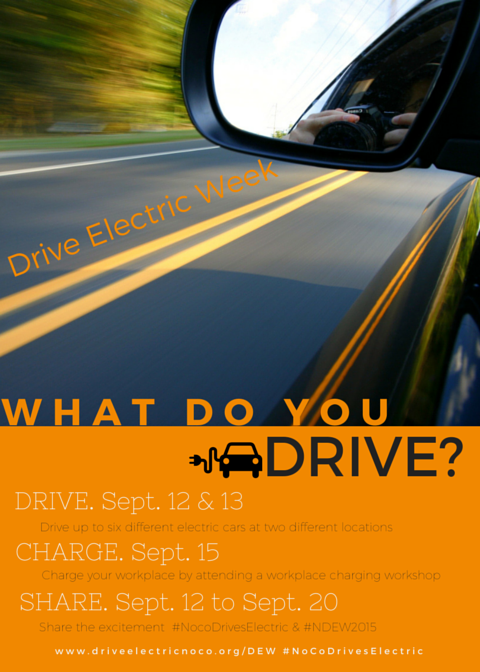 Drive Electric Week 2015 is upon us, and Drive Electric Northern Colorado is hosting a business workshop in collaboration with the cities of Loveland and Fort Collins, and Colorado State University. These organizations, along with several other Northern Colorado workplaces that are currently offering charging, will share their expertise and lessons-learned regarding workplace charging. Julie Zinn and G.J. 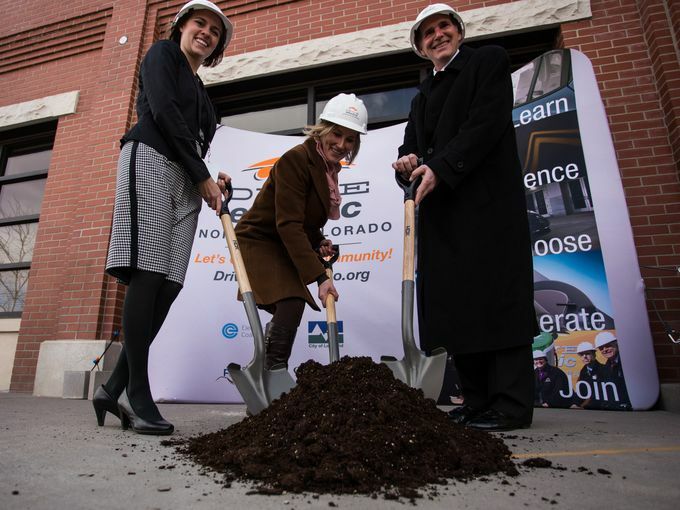 Piermann of Spirae, and Annie Freyschlag of Drive Electric Northern Colorado break ground on Spirae’s plans to install EV charging stations later this year. Photo courtesy of The Coloradoan. The Workplace Charging Challenge is important because 90% of charging takes place at home or at the workplace, creating a significant opportunity for employers to increase EV adoption. DENC has also found through our research in Northern Colorado that 89% of Northern Coloradoans would be more likely to purchase an EV if they had the ability to charge at the workplace. Ultimately, this represents a great opportunity as a company to decrease the harmful tailpipe emissions associated with your employees’ commute to work. This incredible employee benefit has also been shown to increase employee retention and attract the best and brightest applicants. The workshop will feature several speakers from companies and organizations offering workplace charging who will speak about their motivation for joining the Workplace Charging Challenge and lessons their company has learned by offering workplace charging. We hope you will join this amazing opportunity. Please reach out to Annie Freyschlag with Drive Electric Northern Colorado at (970) 987-3055 or afreyschlag@electrificationcoalition.org if you have any questions.